Over the last 2 years, the Global Disaster Preparedness Center has developed and launched the Business Preparedness Initiative which aims to protect livelihoods and promote more comprehensive community resilience. It does so by providing easy-to-use, adaptable and scalable tools for small business preparedness. Small businesses play a critical role in communities and ultimately in global markets as well, contributing to employment at home and supply chains around the world. They are instrumental in restoring economic activity at a community level in the wake of disasters. While many small businesses are intuitively aware of the importance of being prepared, studies have shown a vast majority do not actively plan ahead. This is due to a high financial cost and lack of actionable guidance and can often cause hardships not only for the business, but also the surrounding community. To lower these barriers effectively, the creation of the Business Preparedness Initiative included diverse multi-stakeholder working groups to determine what tools would best serve small businesses, rapid prototyping, and thorough research on dimensions of organizational resilience which go past standard business continuity and allows businesses to look wholistically at their businesses operations, their people, their community, and their supply chains. 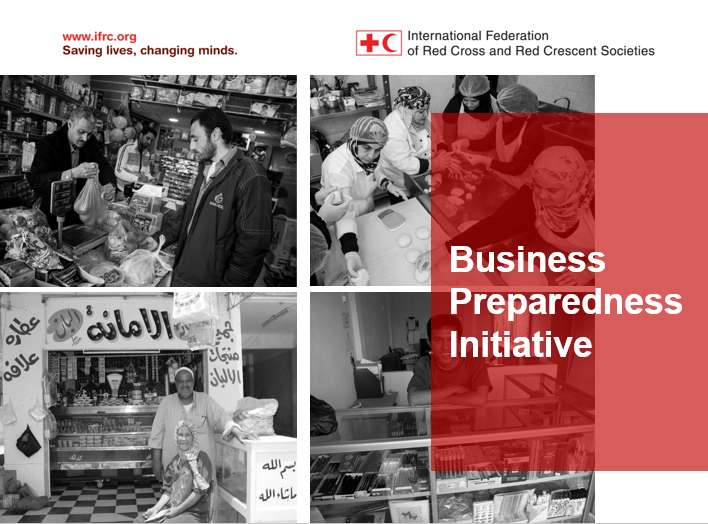 ​​The Business Preparedness Initiative (BPI) aims to save lives, protect livelihoods, and shorten recovery time by providing small businesses with an adaptable suite of preparedness tools and services, developed in partnership with committed stakeholders and subject matter experts, for use globally by Red Cross and Red Crescent (RC/RC) national societies and partner organizations. The primary aim is to build the disaster resilience of small businesses. The secondary aim is to better position RC/RC national societies among business communities to facilitate multi-faceted investment toward safer communities. Led by the Global Disaster Preparedness Center (GDPC) with the help of RC/RC national societies, the BPI provides a mobile application (Atlas: Ready for Business) that small business owners and managers can use to assess their level of preparedness for natural and man-made disasters. Utilizing this free tool, business owners or managers learn to improve their preparedness at their own pace. They are guided to examine operational readiness, networks and relationships, leadership and culture, change readiness, and their ability to assist their people at work. As they progress through the app, users are tested with real-world disaster scenarios with increasing challenging levels. To support their learning, business owners can complete tasks alone or alongside their employees. Based on progress and inputs, Atlas skillfully auto-generates a shareable ‘Crisis and Recovery Plan’ which can be used not only during disasters, but also to exercise readiness and educate staff. The mobile application utilizes interactive features, including a human-like chat that messages with the user to gain insights to guide them on their unique journey towards resilience. This journey is enabled through Atlas’s flexible content management system which can show the user location-specific content, facilitate translation into unlimited languages, and include sector-specific content to better assist businesses. Exploratory workshop for local coalitions and national Red Cross and Red Crescent societies interested in small business preparedness integration into their wider community resilience work. This workshop includes participatory sessions, including a mapping exercise to identify enabling partners and relevant local stakeholders, an opportunity to define roles, aspirations, and capacity, as well as creation of a joint vision and plan for roll-out of decided-upon tools. Workshop in a box for small business continuity and resilience: This workshop includes the basic tenants of business continuity – including, but not limited to, a hazard assessment, dependency map, emergency supplies checklist, self assessments, succession planning, contact list templates, and emergency communication procedures for the participating businesses. For implementers, it provides presentation materials, talking points, invitation templates and outreach and media release templates. By marketing to small businesses, which form the backbone of local economies, local-level resilience, response, and recovery will be improved. Small businesses employ members of the community, provide resources for people to meet their daily needs, and contribute to local business districts, as well as regional and global supply chains. The BPI will reach and engage this robust market weaving preparedness activities into day-to-day business operations. The BPI provides large corporations, government, and business associations with the opportunity to engage with small businesses in their communities by forming coalitions for implementation that promote BPI tools and resources (mobile application and wrap-around resources). The overall benefit will be a better connected, well-informed, resilient community where large, medium, and small businesses alike will be able to work together to ensure quick disaster recovery. Why the GDPC and RC/RC Network? The GDPC has a highly unique position within a large network to make an impact in the business preparedness field. As part of the International Federation of the Red Cross Red Crescent Societies (IFRC), the GPDC is linked to 191 national societies and over 160,000 branches and local units of the RC/RC network, illustrating a large distribution channel with diverse resources. Additionally, the RC/RC has a positive image and worldwide recognition with both public and private sectors. Due to these factors, the RC/RC network allows the GDPC to market these business preparedness tools and services globally. The GDPC will utilize its role to provide the network needed to increase entry points into business communities around the globe, while providing a relevant service and promoting stakeholders with a particular interest in business preparedness. Additionally, the abovementioned tools and services would be backed by the integrity and reputation of the RC/RC network. 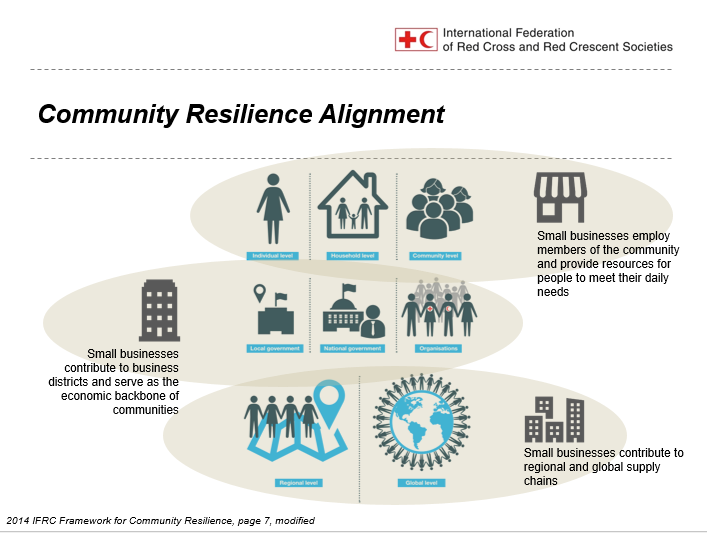 The BPI also supports the IFRC-led One Billion Coalition for Resilience (1BC) by fostering partnerships in communities between the various stakeholders involved in the BPI ultimately strengthening the overall community resilience. Are you a small business interested in this program? This is a great initiative, and timely to learn about it. The Sister Cities International 60 Days of Impact campaign is going on right now, leading up to our annual conference in Washington, DC - (July 13-16). The Business Continuity Initiative seems like a great fit for an activity that might be promoted between sister city pairings to share lessons learned, as well use good ideas that might be modified to locate circumstances to make each of our cities more resilient. I would like some guidance and advice to help set up activities with each of our 9 sister cities (in 8 countries, including Sendai, Japan).